Diwali is here and so are all my favorite dishes. But alas this time I am far away from my mother. Or else I simply help her in cooking all the delicacies or she simply sends me all the yummy snacks she makes and I simply indulge. But this time it was different She is in India and I am here. So I thought to make it this diwali for my family and friends. Generally making chakli is a very long process. First you need to roast many different dals and things and then grind it in a mill and then make it. But this one is Simple and quick to make. No roasting, no grinding, no waiting, just knead it and make it. I made this type for the first time with recipe from my Mother. Grease the chakli press (mould) with a little oil on the inside and also on the bottom plate. I followed this step every time I refilled it. Heat oil in a kadai. While the oil is heating start making Chaklis. Remember to follow steps 2 and 3. When starting of the chakli, start making the circles closely, do not make it too far, or else your chakli will break in oil. When completing any chakli at the end pinch it lightly to seal it so that it does not open. Make atleast 2-3 batches (In one batch atleast 8-10 or depending on the quantity of your oil and size of pan) or else it becomes difficult to make and fry at the same time. Do not over crowd the pan/Kadai, it will not cook properly. When Chakli’s are first immersed in oil, the oil should be hot (high flame – but also pay attention as they cook very fast, we do not have to burn it, so adjust the flame to medium-high or high). If not, your chakli might break. Once you have added all the chakli’s switch the flame to medium. This helps in cooking the chakli. Then turn and cook on the other side. (again for 4-6 minutes) or until brown on both sides. 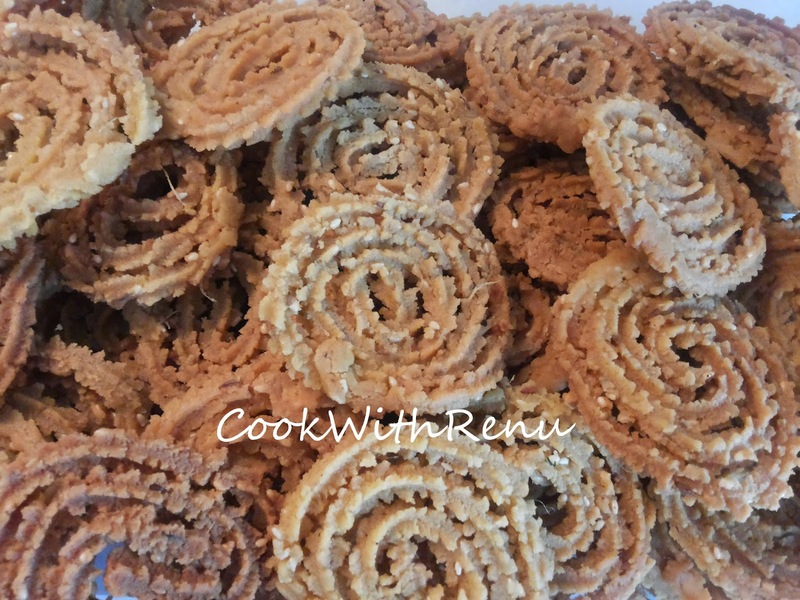 Yummy chakli’s are ready. Store in an air tight container. Note: Now for all the masala’s I added it approximately, but still I tried to list it down based on spoon measurements. One can adjust it according to taste.